WKU student Skyler Ballard won the third multimedia competition of the 2018-2019 Hearst Journalism Awards Program and qualified for the National Multimedia Championship in June in San Francisco. Ballard, a senior from Coxs Creek, won the Multimedia Enterprise Reporting Competition for his piece titled En Muerto En Vida published in Wkupj.com. Ballard received a $3,000 award; WKU’s School of Journalism & Broadcasting received a matching grant. WKU senior Brook Joyner of Chattanooga, Tennessee, finished ninth. After three of four multimedia competitions, WKU is in third place behind University of North Carolina at Chapel Hill and University of Nebraska-Lincoln. The rest of the top 10 is: University of Florida; Arizona State University; Pennsylvania State University; University of Montana; University of Missouri (tie); University of South Carolina (tie); Brigham Young University (tie); San Francisco State University (tie). The final top three intercollegiate winners will be announced in May. WKU has won the Hearst Intercollegiate Multimedia Competition for seven straight years. Earlier this spring WKU won the Intercollegiate Photojournalism Competition for the 25th time in the past 30 years. 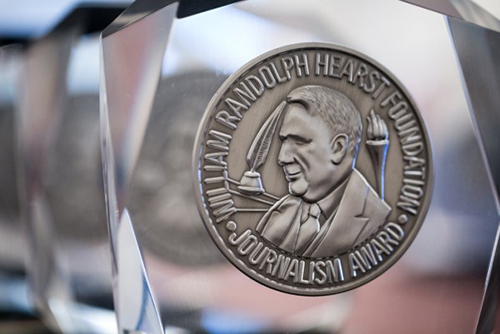 In 2018, WKU won its fourth overall national championship in the Hearst Journalism Awards Program. WKU won overall titles in 2000, 2001 and 2005 and has finished in the top three overall for nine straight years and in the top eight nationally for 25 straight years.